The streets (in blue) run north-south around the hexagonal blocks. I numbered them, although obviously, the indexing is off and 1st Street should be at the far west end of the city. The avenues (in red) run northeast-southwest. I gave them Latin letters. The boulevards (in green) run northwest-southeast. I gave them Greek letters. The east-west (horizontal) blocks are on both an avenue and a boulevard. The northeast-southwest blocks (diagonal bottom left to upper right) are on both a street and an avenue. The northwest-southeast blocks (diagonal upper left to bottom right) are on both a street and a boulevard. Can you locate A Avenue and Gamma Boulevard? Addresses could be given this way: "22 A Ave. and Gamma Blvd." I think address numbers would reset for each block; there would be a "22 A Ave. and Beta Blvd." How hard would it be to navigate? Let's say you lived at 1st Street and A Ave. and wanted to travel to 4th Street and Alpha Blvd. You know that you need to go east (to higher numbered streets) and not sure whether you need to travel north or south overall. But you don't need to worry. Just head northeast on A Ave. Either you'll intersect 4th Street first or Alpha Blvd. first. LEFT - N on 1st Street, NW on Gamma Blvd. RIGHT - NE on A Ave., SE on Gamma Blvd. LEFT - N on 2nd Street, NE on A Ave. RIGHT - S on 2nd Street, SE Gamma Blvd. LEFT - N on 2nd Street, NW on Beta Blvd. RIGHT - NE on A Ave., SE on Beta Blvd. LEFT - N on 3rd Street, NE on A Ave. RIGHT - S on 3rd Street, SE on Beta Blvd. At all four points, you would choose to continue driving northeast on A Ave. The numbered streets are increasing, which is correct, and the Greek letters are decreasing, which is also correct. You know you're going the right way. LEFT - N on 3rd Street, NW on Alpha Blvd. RIGHT - NE on A Ave., SE on Alpha Blvd. You've reached Alpha Blvd, so you're going to turn on it. Which way? Northwest or southeast? You're at 3rd Street. Not far enough east, so turn southeast on Alpha Blvd. You've almost arrived. A right turn puts you onto 4th Street and Alpha Blvd., the block you are looking for. It would take a little getting used to, but I don't believe this kind of navigating in insurmountably complex. 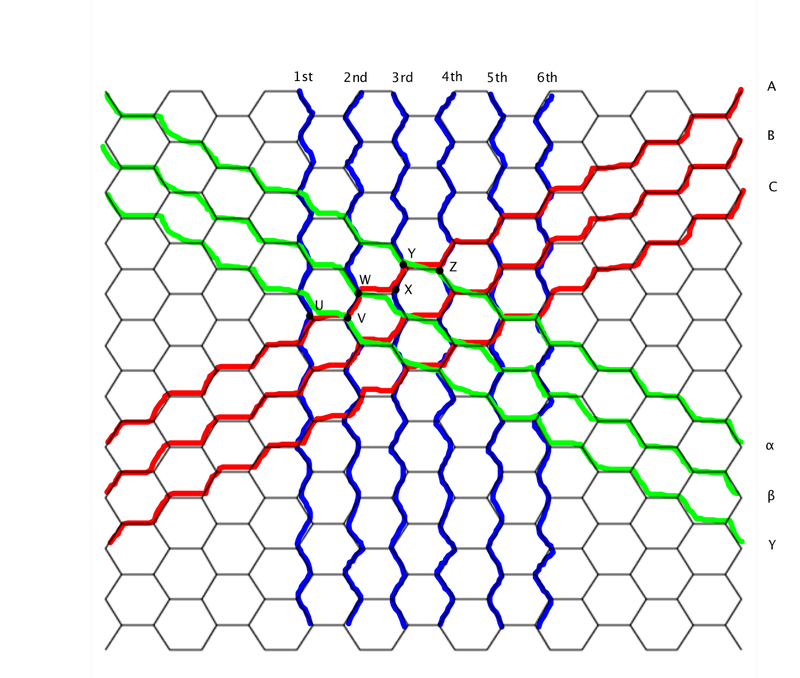 Would it take longer to travel on a hexagonal grid? 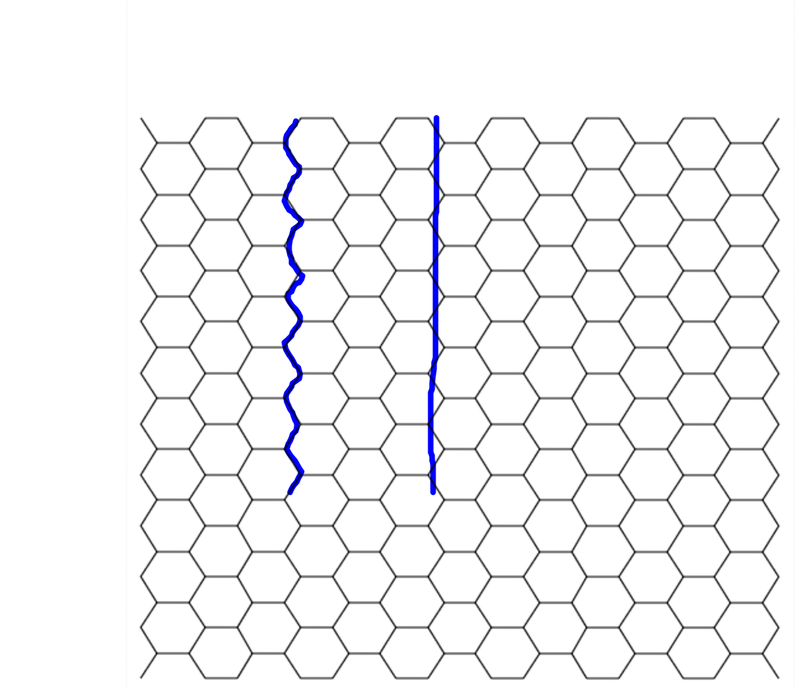 If one is traveling in a straight line on the rectangular grid, the hexagonal grid is 15% longer. But if one is traveling in a "straight" line on the hexagonal grid (at an oblique angle), the rectangular grid is about 18% longer. Averaging them all together came up with that the hexagonal grid is about 0.3% longer, but that really might just be variability of taking a random sample. I'd say it just about evens out. So, are travel times the same? One thing to consider is that the intersections on the hexagonal grid are faster, three-way intersections as opposed to the slower, four-way intersections in a rectangular grid. In a three-way intersection, there must be three cycles. Each right turn is allowed in 2/3 cycles; each left turn is allowed in 1/3 cycles. In a four-way intersection, there must be four cycles. Each right turn is allowed in 2/4 cycles (or 3/4 cycles if right-on-red is allowed); each left turn and each straight is allowed in 1/4 cycles. Comparing the two types of intersections, left turns are 33% faster in the three-way intersection; assuming no rights-on-red, right turns are also 33% faster in the three-way intersection. That means that the three-way intersections are 33% faster overall. Because the travel distance are just about equal, the hexagonal grid is actually going to be faster due to the faster intersections. Maybe bees are onto something. As one more thought, it'd be quite easy to make park blocks at a ratio of 1/7 blocks. No location would be more than 2 blocks from a park. If you make all the streets one-way then you never need to stop or cross traffic. It's possible that every intersection either merges with another street or divides into two. This is a very good thought, there are various capacity and safety advantages for 3 way intersections. A further thought is that a Cairo tessellation would allow a straighter route for the trunk roads and might provide a bit more flexibility. That's an interesting suggestions Tom, but Cairo tessellation still has four-way intersections. I wonder if there are any other irregular tessellations with advantageous properties? How did you compare the hexagonal vs square plots? Do they have the same area? When you compare the time it takes to travel from one point to another do you also count the number of intersections crossed? My intuition is that you would have to cross more in a hexagonal grid than in a square one but I have not tested this. I don't believe it makes a difference what size the plots are, though I might be wrong. The "straight" line on the hexagonal grid is 15% longer (blue diagram), whether the hexagons are large or small. 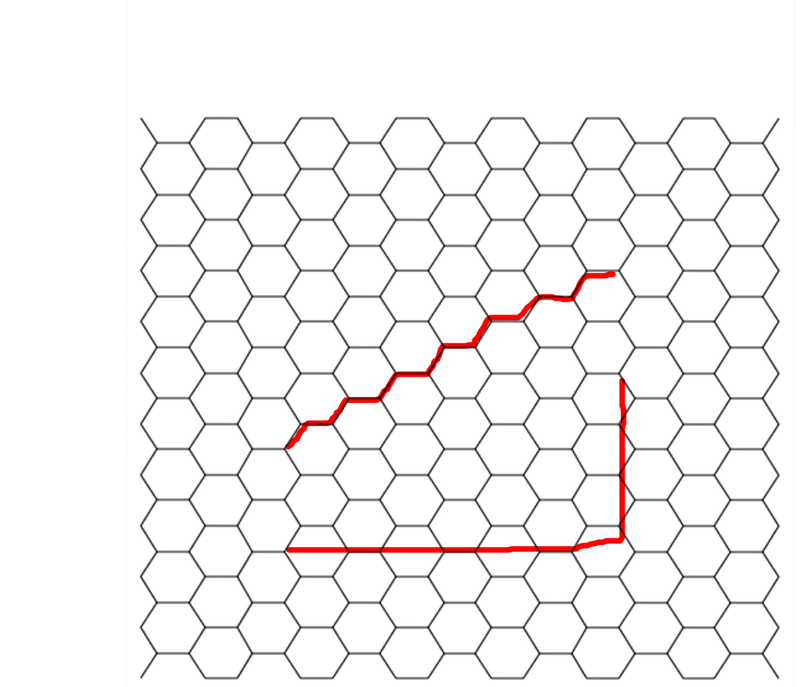 Likewise, the corners in the rectangular grid add about 18% (red diagram), whatever the block size. It's really about whether the locations line up on grid lines or not, which is basically a wash. However, you make a really good point -- the size of the blocks will make a big difference about how many intersections one has to go through. I would imagine the hexagonal blocks have to be bigger to keep intersections at the same frequency. Square grids where all roads are one-way streets that alternate will only have 2 traffic cycles.